The Hydrangea hot tub is certainly one of our favourites with enough room for four people to sit comfortably including the lounger. The strategically placed jets in this spa massage the upper and lower back, the legs and feet. 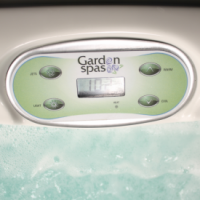 You can also customise your massage by using the diverter system and air controls.